Our industry owes a great debt of gratitude to this man for his inventive spirit at the dawn of our industry. April 2016 a new Blue Plaque was unveiled - click the plaque above to view photos and reports. 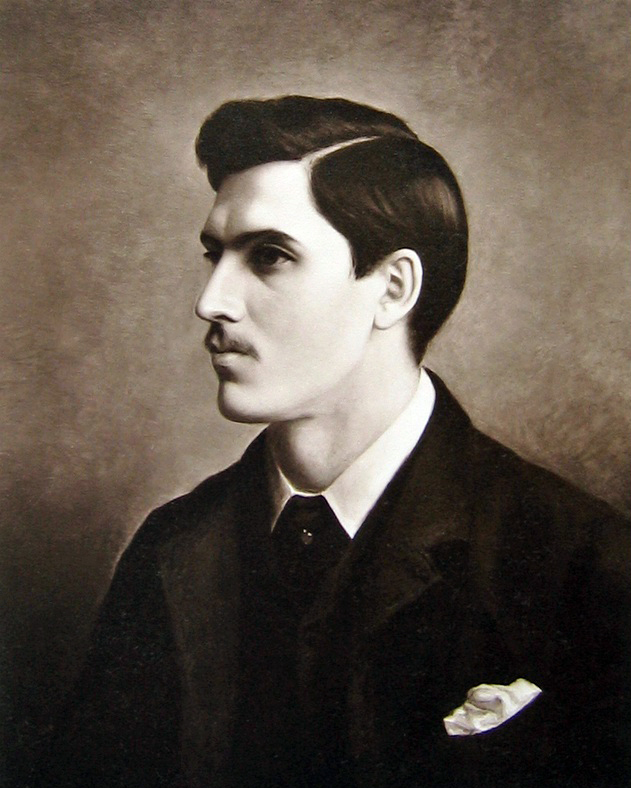 "My great great grandfather, Cesar de Ferranti, came over from Belgium and set up a studio in 1859 in Sandon Terrace in Liverpool with his new father in law- William Scott. William was a successful “jobbing” portrait painter - one of the last of his kind. The advent of photography killed his trade. One might have thought that when his daughter Juliana married Cesar (one of those early portrait photographers) he would have been horrified. Perhaps he was? But - instead of fighting - William helped him on his way by setting up a studio for them both (a combined painting/photo portrait gallery), thus giving Cesar an introduction to all his contacts. The church where the wedding ceremony took place was St George's Church, which was demolished in the late 1890's and replaced by the Queen Victoria monument - which is still there." The Queen Victoria monument survived the Blitz almost intact when all around her was devastated. In 1861 William Scott and his wife Sarah were living at 25 Pilgrim Street, Prince of Wales Plume in Liverpool. William died in 1862 at 1a Sandon Terrace and was buried in Toxteth Park Cemetery where his wife and daughter Emily Anne Scott (also a portrait artist) where soon to join him. 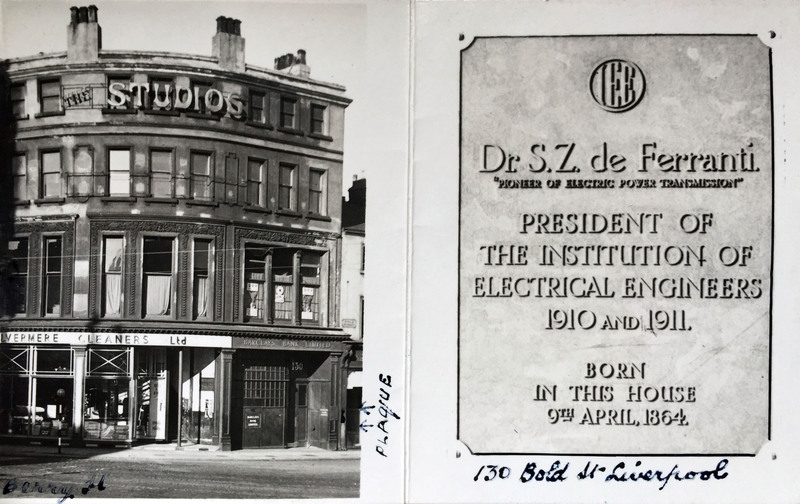 In 1863 Cesar opened a studio in Havelock Buildings 130-2 Bold Street, where, a year later on 9th April 1864, his son Sebastian de Ferranti was born. After a while, as Cesar's work flourished, a separate home for the family was bought across The Mersey in Egremont, allowing Cesar more room for his studio in Bold Street. Sebastian showed signs of extraordinary talent from an early age, and by his late teens was earning money from his inventions. 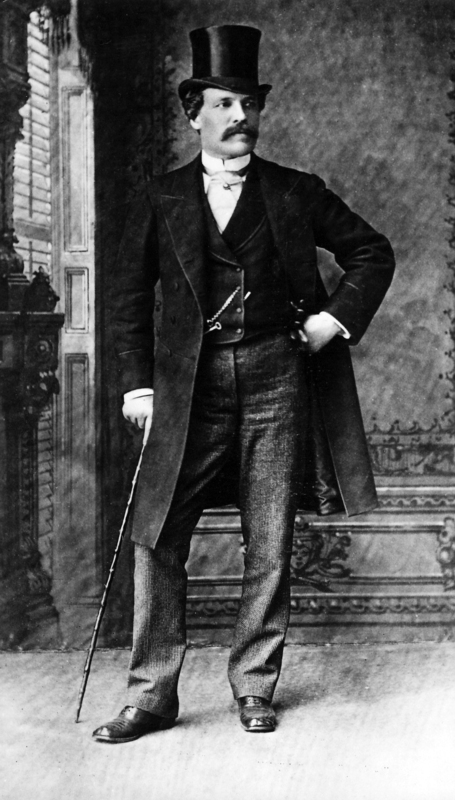 This was just as well because in 1881 his father became bankrupt. Cesar had taken a mistress and she was his undoing. At that time, smart Liverpool society would not tolerate a man known to have a mistress and he lost most of his clients. The unscrupulous mistress made on-going unrealistic financial demands and Cesar’s wife was forced to go out to work as a music teacher and dressmaker to support the family. Sebastian had to abandon his university studies in London and find work. His huge talent was very quickly recognised and the rest of his story is history. (see below) His half-sister Vanda was an extremely talented artist. She painted the portrait of Sebastian at the top of this article. Because of the family’s financial difficulties she became a nun – although it took her several attempts before she was able to commit and take her vows. Sebastian did not return to Liverpool. After he formed his “Ferranti Company” in London he looked for a suitable site up north and found one in Manchester. It was to this site that many MANWEB student engineers did their manufacturers training at Ferranti in Hollinwood, in the transformer factory. During WW1 Sebastian drove the government of the day to allow him to convert the company to make arms. The government would not be persuaded until after “The Great Shell Scandal” of 1915 when the British troops in France and Belgium ran out of shells. An exhibition at Manchester Museum of Science and Industry tells the story. 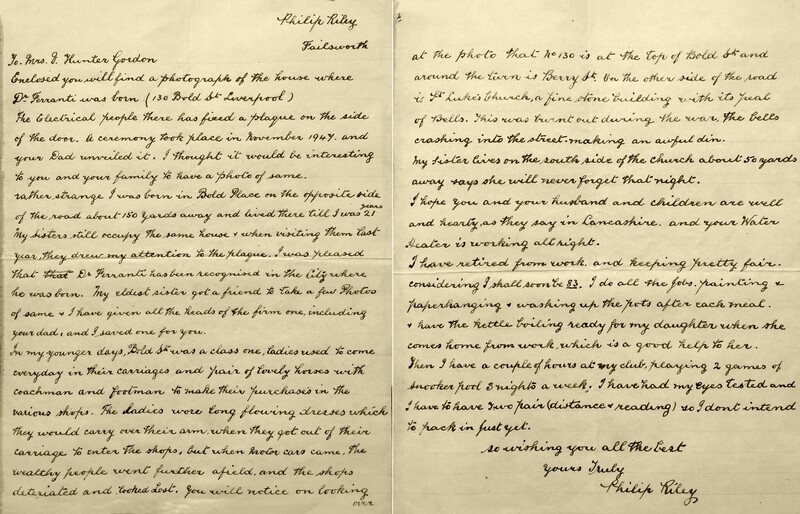 Sebastian was living at nearby Baslow when he died in 1930. He had converted everything in the house and adjoining farm to run by electricity. 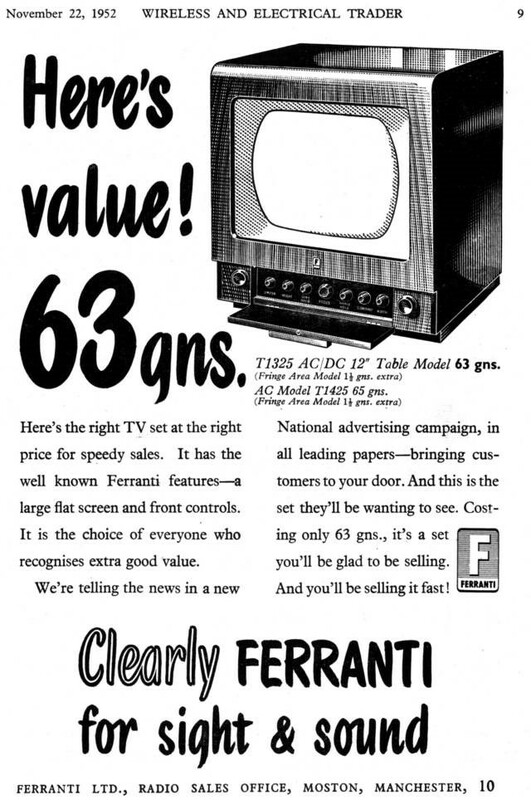 After his death in 1930 the company, Ferranti Ltd, passed to his son Vincent and then after Vincent’s death in 1980 to Vincent’s sons – Sebastian and Basil. 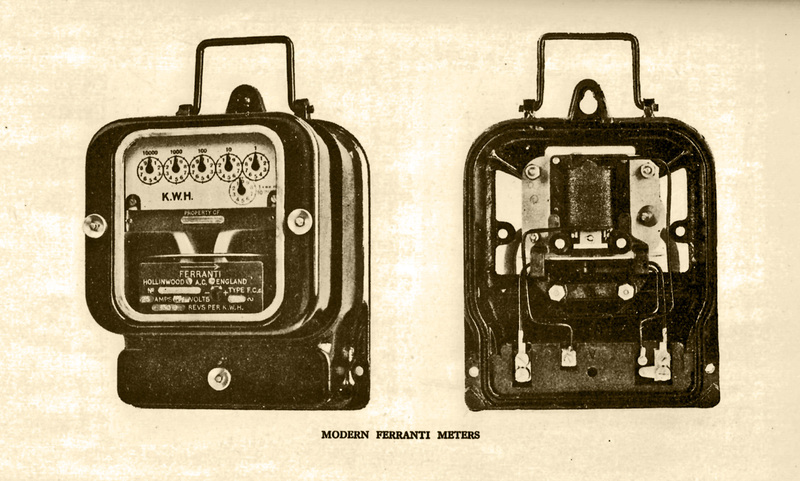 The name still lives on in Denis Ferranti Meters Ltd.
Sebastian Pietro Innocenzo Adhemar Ziani de Ferranti (April 9, 1864 - January 13, 1930) was an electrical engineer and inventor. 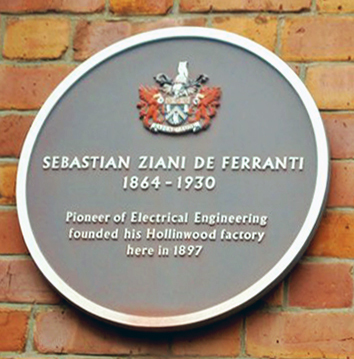 Sebastian Ziani de Ferranti was born in Liverpool, England. His father, Cesar, was a photographer and his mother Juliana (née Scott) was a concert pianist. He married Gertrude Ruth Ince on April 24, 1888 and they had seven children together. 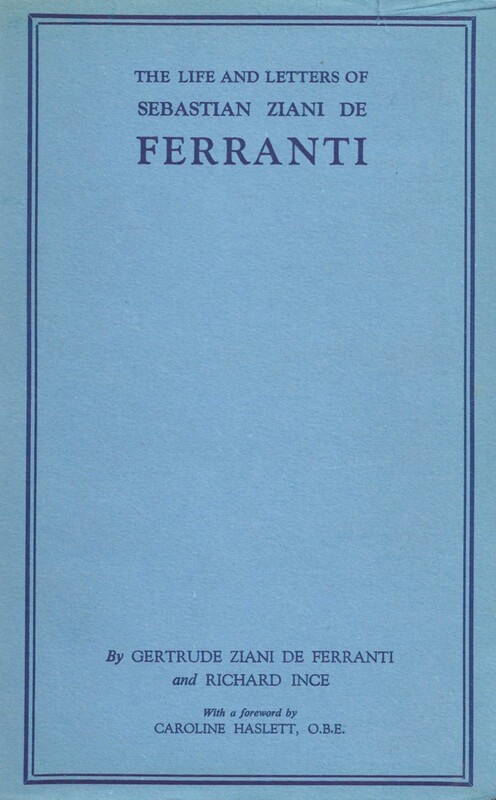 Ferranti died on January 13, 1930 in Zurich, Switzerland. He was buried in the same grave as his parents and his daughter Yolanda at Hampstead cemetery, London. 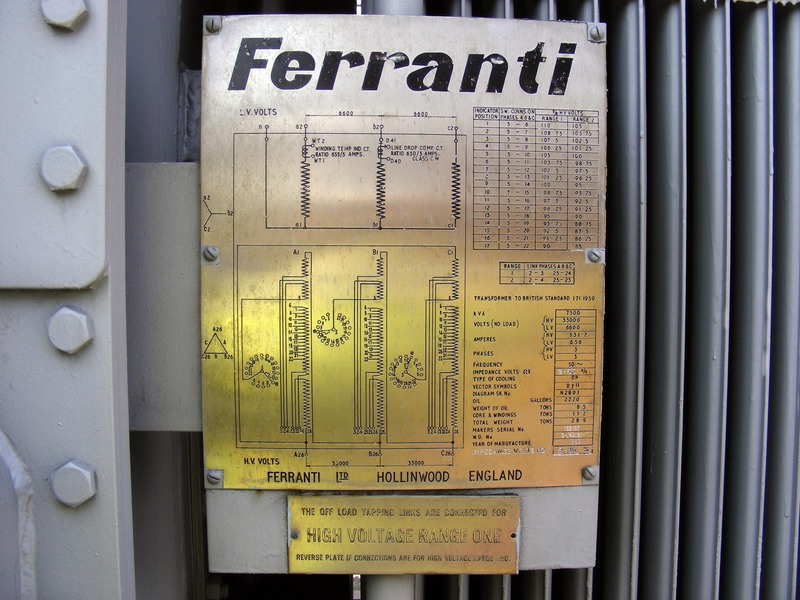 Ferranti showed a remarkable talent for electrical engineering from his childhood. His first invention, at the age of 13, was an arc light for street lighting. Reportedly, around the age of 16, he built an electrical generator (that had a "Zig-zag armature") with the help of Lord Kelvin, and later patented the device (called the "Ferranti Dynamo"). He naturally went into this business, in 1882, when he set up shop in London designing various electrical devices. In the late 1880s there was a debate within the industry about the transmission of electrical power, known as the War of the Currents. Thomas Edison supported a direct current (DC) based system, largely due to his holding many key patents and having set up some power plants supplying DC power. His rival, Nikola Tesla, supported an alternating current (AC) system that was being backed by Westinghouse. 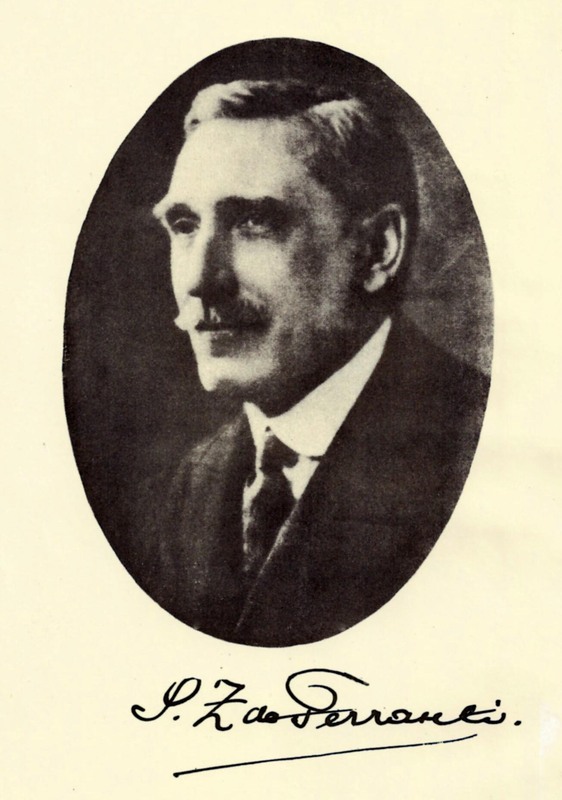 Ferranti realized early on that AC was the only practical option He was one of the few experts in this system in the UK and in 1887 the London Electric Supply Corporation (LESCo) hired Ferranti for the design of their power station at Deptford. He designed the building, the generating plant and the distribution system. 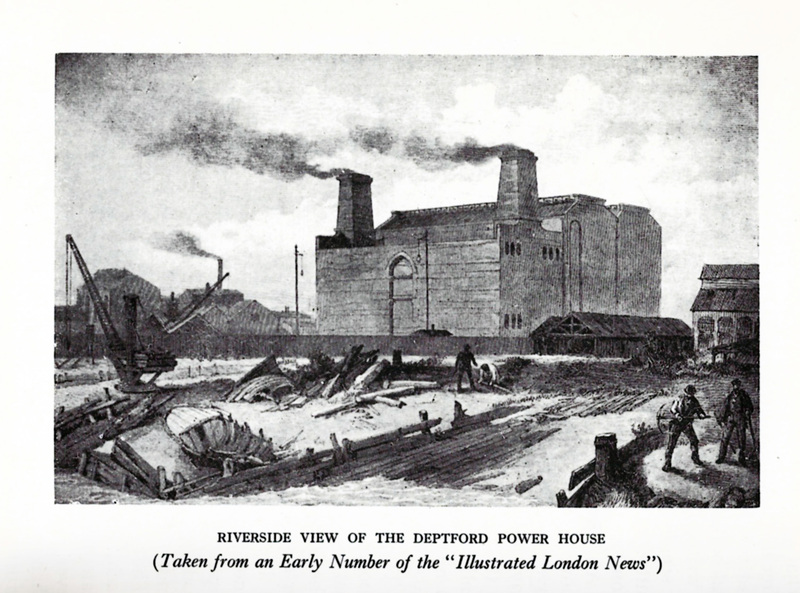 On its completion in 1891 it was the first truly modern power station, supplying high-voltage AC power that was then "stepped down" for consumer use on each street. This basic system remains in use today around the world. One of the remaining supports of the generating hall of Deptford Power Station forms the frame of the sign at the Manchester Museum of science and Industry in Manchester UK, home of the Ferranti Archives. After building the power station, he then worked on and attained his dream - to enable power to be transmitted around the country to every home - what we now know as The National Grid. 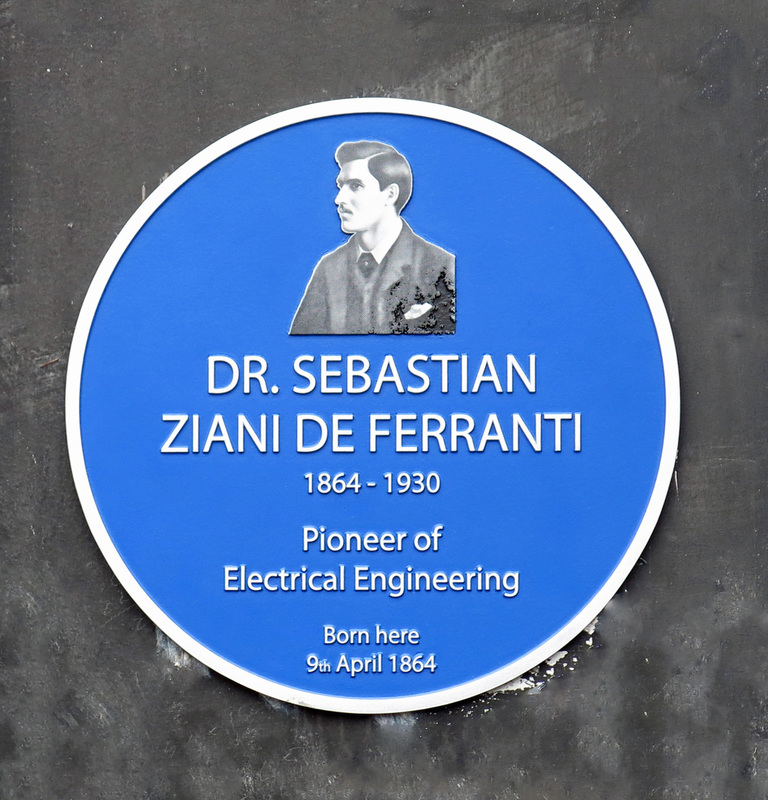 Sebastian Ziani de Ferranti was President of the Institution of Electrical Engineers in 1910 and 1911. He was elected a Fellow of the Royal Society in 1927 and in 1946 his second son Sir Vincent Ziani de Ferranti was also elected President. An early Bold Street scene, at 130 Bold Street, with many thanks to Barclays Group Archives for permission to use photo which shows how it was in 1942. More information from Barclays Group Archives. 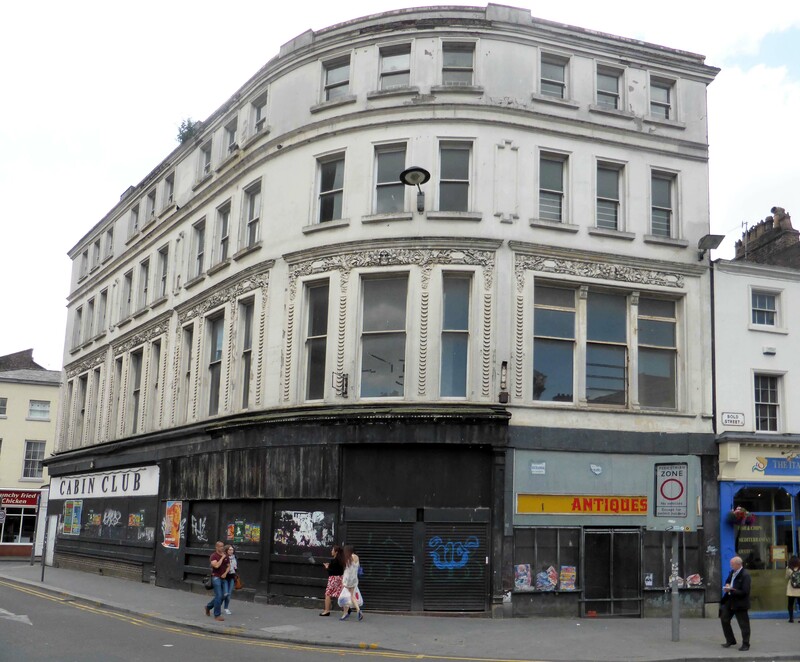 The branch opened in August 1923 at 99 Bold Street and closed in April 2007, again at 99 Bold Street. However, on 5 May 1941, 99 Bold Street was destroyed by enemy bombing. The Bank took out a lease on 130 Bold Street on 1 August 1941, and a branch remained at 130 Bold Street until 6 June 1956, when new premises had been constructed at 99. St Luke's Church opposite Havelock Buildings was hit by an incendiary device on the 6th of May 1941, which caused a fire that destroyed most of the building, leaving a shell now nicknamed "The Bombed Out Church." 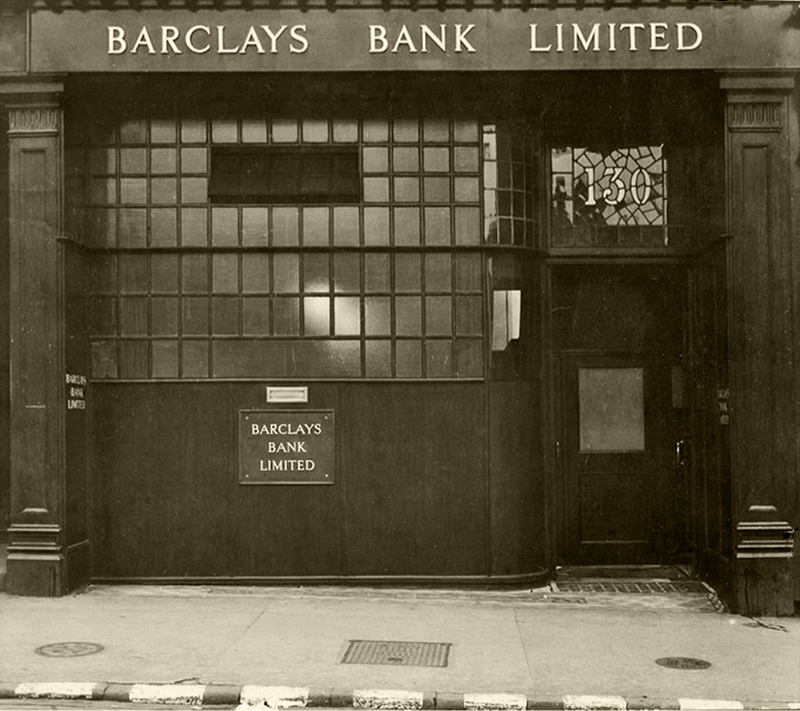 130 Bold Street is part of Havelock Buildings and right hand photo shows the plaque that was installed November 1947 on the leased Barclays Bank. View in July 2015 now looking tired and with no plaque. Then in April 2016 that situation was changed with the new plaque mentioned earlier near top of the page where, if you click the Blue Plaque image, more photos and details of the 2016 event are to be found. The two images above show Sir Vincent Ziani de Ferranti (on left of the black and white photo) unveiling a plaque in November 1947.
and in 1946 his second son Sir Vincent Ziani de Ferranti was also elected President of the Institution of Electrical Engineers. 1947 was 20 years after his father had been elected Fellow of the Royal Society and this first Plaque may have been to mark that occasion, then in April 2016 another plaque was unveiled. This time the granddaughter of Sir Vincent - Dr. Frances Ross is shown holding the Plaque surrounded by many members of the Ferranti Family. 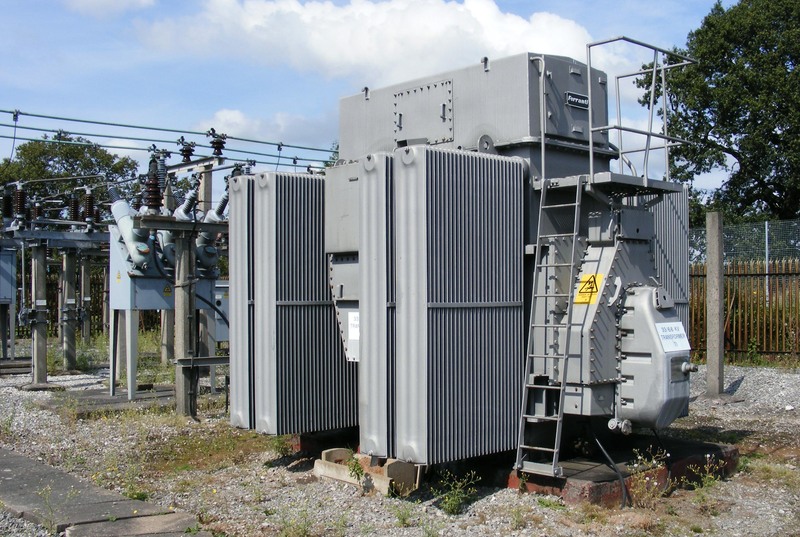 This Plaque celebrates Hollinwood; then a Ferranti Plate from 33/6.6kv transformer and a 33kv Primary Transformer attached to the network. Web Links are about William Scott and Zani de Ferranti and also a digitized copy of the Life and Letters of Dr Sebastian Ziani de Ferranti.